As if the thought of a day on the beach wasn’t enough to tempt the roaming traveler in your soul, we have another reason for you to book a plane ticket right now. There are beaches that have sand with all the colors of the rainbow! Can you imagine lying on a blanket on red beach sand? Or lounging on a beach chair on red sand? Or sipping a beer under a sunshade, burying your toes in green sand? Okay, maybe you can't do this all in one beach. But from the Red Beach in Santorini, Greece to the serene green shores of Papakolea Beach in Hawaii, the world is packed full of colorful beaches for you to explore. They may sound like something out of a sci-fi movie, but there’s not a lot of mystery behind how these gorgeous shores came to be. Beach sand is created by the breakdown of the reef, either by mechanical forces like waves or from bioerosion caused by grazing fish. Some sand includes remnants of volcanic glass or other elements as well, which helps to lend it a more interesting hue. White sand beaches are great, but there are hundreds of other beaches in the world with black, green, and even red sand. You need to explore these beaches pronto! Red beach sand can be formed in a variety of ways, but it is most commonly caused by the deposits of iron-rich red and black lava rocks. 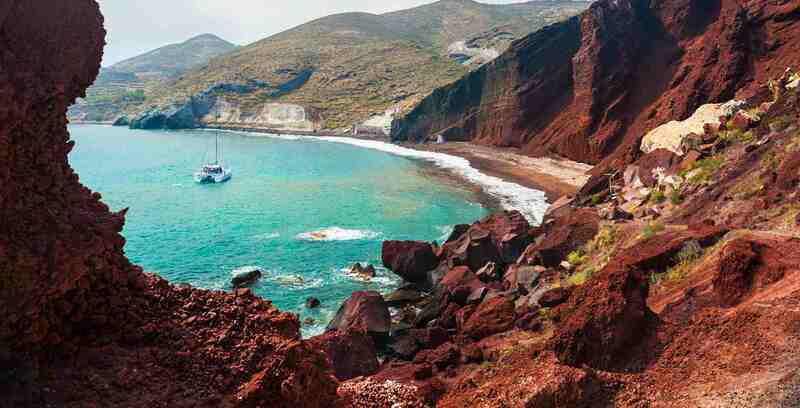 The Red Beach in Santorini, Greece is one of the best places to glimpse the beautiful work of of past volcanic action. Papakolea Beach is located at the southernmost tip of Hawaii’s Big Island, and if the name is too tough for you to pronounce, don’t worry - most people just call this beach the Green Sand Beach. And it’s no wonder why! This beach is covered in olive-green sands. They are the results of olivine crystals that were deposited from surrounding lava rocks in the Pu’u Mahana cinder cone of Mahana Bay, just one of many gorgeous natural places on the Big Island that were formed as the result of ancient (and recent!) volcanic activity. New Zealand has plenty of natural treasures, and the Muriwai Black Sand Beach is one of them. This gorgeous beach is home to over 37 miles of sparkling black sands. These sands were composed out of volcanic matter such as iron and titanium, and the shores offer a great place to lay in the sun - or catch a wave. 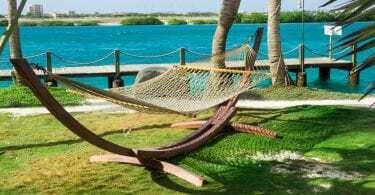 The world is packed to the brim with white sand beaches, and we would be remiss if we concluded this article without mentioning a single one. One of the most gorgeous white sand beaches in the world is Hyams Beach in Australia. It is actually listed in the Guinness Book of World Records as the whitest beach on the planet. The sand here is made out of tiny quartz particles, which give the ground its luminescent glow. What are you waiting for? These beaches are calling you. Grab your camera, and make sure you bring your sunglasses - the colors will be absolutely dazzling.